Thanks for everyone's encouragement to attempt that circular quilt.... I don't think I am going to try it too soon because I am just not in the mood for a major challenge right now. I did, decide however, to do triangles today - so that's a bit more challenging than the other kinds of things I have been doing. I have not yet blogged about last weekend's quilt show - Mancuso- but that is coming. While there, I picked up a charm pack of "City Weekend" and had to start sewing with it immediately. I really should not have bought the charm pack - so I definitely couldn't justify getting this ruler (which I have wanted forever) - so I had to improvise a way to make half square triangles. Yes, I tried using my normal quilting ruler to draw correct lines down the center of the squares- but that was just a joke. So anyway, I found this 1/4" quilter's tape (undoubtedly bought at a yard sale a while ago) and lined it up down the center of the square and sewed on either side of it. I don't really recommend it, but it worked out okay. I finished the quilt top today - it was really quick. Unfortunately, I couldn't get decent pictures though- I really rely on outdoor lighting and it's been rainy/gloomy all day. If you are a child of the 80's like me - please tell me where this song comes from, "Pinwheel, pinwheel.... turning around....." It's been in my head all day. I have to say that Moda has a good thing going with doing all of these pre-cuts. A charm pack is an affordable little invention that gives you a decent sized sample of every print.... It makes you want more of the fabric when they finally release it in yardage. I have to say that I am a big fan of this line now - when I saw glimpses of it online, at first I was kind of doubtful about it. But it's got a lot of good basics and many prints that are boy friendly. 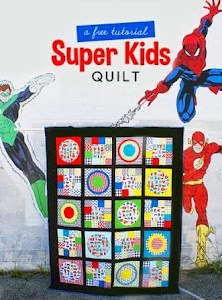 I am contemplating doing this quilt with these Hope Valley fabrics: (because I really like this quilt - but I don't like the raw edges). Am I crazy? I was really excited to be able to swap some unwanted fabric for the Melly and Me "Black Forest Purse" pattern. I whipped this up all in one day - yesterday actually. I went to bed with only having not attached the buttons. For some odd reason, I was recently thinking that I didn't really like Amy Butler fabrics that much - maybe because I have been working with a lot of bright, juvenile prints lately and was thinking about the merits of those... But this "Water Bouquet in Midnight" fabric is easily one of my favorites. I still want to make another purse, apron, and include it in a Amy Butler "Love" quilt. These buttons couldn't be more perfect for the bag. When I was searching through my button collection, I could only find 2 and was lamenting the fact that I really needed 3. But obviously - I found another and I think it is a perfect match! Made with leftover pieces from this quilt. I completed 2 birds last night while watching a disc of Project Runway. That show got me through 4 months of sitting on the couch with a newborn. Is it me, or is it kind of boring until you see the "runway" part? I sold some of my Heather Ross and Flea Market Fancy in order to pay for buying some of 2010's best fabric collection debut: Urban Circus. Now I have been accused of liking the designer, Laurie Wisbrun, only because we share the same name. Let me tell you.... it doesn't hurt! Just kidding, but seriously - these elephants are my absolute favorite!!!! Tonight I am making a bunch of bibs for Gregory before I sit down to two hours of Glee and more hand-sewing: I have wanted to make this bird mobile for quite a while, but wasn't too thrilled when I learned how difficult it might be to sew these little buggers on the machine. No thank you. Luckily, I know this project will go much faster than my Grandmother's Flower Garden quilt. And for the first time ever, I really cut myself with the rotary cutter today. Luckily Nick was home because it would've been hard to take care of myself and Gregory. Don't worry, what you see on the band-aid is first aid creme, not blood! Turns out I really didn't get many pictures at the Lowell Quilt Festival. I did capture a very cheerful Monet holding Gregory, but I wasn't sure if she wanted that plasted on the internet. (It's a great picture- don't worry Monet!) She held Gregory a lot as we walked around and I was impressed with her strength. I confirmed that Gregory weighed at least, if not more, 1/4 of her weight. This is the project I completed over the last half of the week. It is a mini quilt called, "Autumn in New England." I made it for a family that is moving out of the area. They have had some trials no one should have to face during their few years here, so I wanted to give them something special. I used techniques I learned from making the Girl in the Swing quilt. The whole project was pretty easy and fun. It is a great scrappy project. I am going to do something very similar like this again soon. I didn't chicken out this time and I did do free-motion quilting - both all around the leaves and tree, as well as the actual quilting. I also finally made a real quilt label. Today, while both boys are sleeping, I am working on a long-overdue wedding present for a dear friend. I used to think I would make everyone quilts when they got married, but then I had a child! These were one of my "top secret" projects I completed on Thursday. Meaghan reads my blog sometimes, so I had to wait to post that I had made a small present for her. She is moving all the way to Seattle soon, and our NEMQG is definitely going to miss her! Meaghan, Monet, and Amy all met in Lowell today for the annual Quilt Festival. It was a great time going with friends who weren't just humoring me (like my husband). I took a few pictures I may post later, but I was a bit distracted with having Gregory along - so I didn't take many. Yesterday was the best sewing day I have had in a while. It helped a lot that Nick took Gregory to a park for a few hours. I had a few top secret projects- I finished one and the other one is coming along great. (Both of these projects were made all from scraps - which I LOVE). I also seized the chance to organize the sewing area in Gregory's room- it had become a SERIOUS mess. I finally got smart and made space for - current projects and another for my favorite fabrics. While I was doing all that, I went ahead and pulled a ton of coordinates for the fabrics that Emily chose when I told her I would make her a graduation present. She is graduating today and I am sad to not be there! This is why I like having a sizable fabric stash even though it clutters my house.... It is so nice to just pull fabrics for a project. I am thinking about either doing an Oh Fransson pattern or something like this. Any opinions or suggestions are welcome. After all my sewing- the day came to an end perfectly when I received an email that Hawthorne Threads had Urban Circus in stock. I think cleaning my sewing space tempered me though- so I didn't go too overboard. Remember this post? Just shortly after my fabric diet started, I decided to make a quilt that required 3 yds of sashing (that I didn't have)..... I tried to go around it by swapping for the solid sashing - but that ended up being a total bomb that is still not resolved. Anyway, I finally gave in and used some of my birthday money plus a 50% off Joann's coupon to get a bunch of Kona Cotton in Ash. And here you are: The free pattern can be found here. Luckily I already have a wonky cut of batting that is big enough for this. I was going to try and start quilting it tonight- but that's not going to happen. I am thinking I might actually attempt free-motion stippling for the first time. Wish me luck! Yesterday I tackled this beast and won! I didn't go to bed until midnight - but it's finished!!! Yay! Staying up late to finish it was probably not wise, as I sewed the last border on incorrectly and spent at least 20 mins with the seam ripper.... aarrggghhh. I showed it to my friend today and she said, "I wish that I could've taken that to my dorm room for my freshman year." I think that is a perfect way to describe what kind of quilt it will be. This makes completed quilt top #5 (?) that I have not quilted... this is much too big for me to do on my own machine. I am really dying to take a local long-arm quilting class. I loved learning a new technique- machine applique. I learned how to do it on my machine and was pleased with the performance of the Wal-Mart adhesive material I bought ages ago. But going around all those flowers! I wanted it to end after flower number three! As if I didn't already have enough to do, the morning of Saturday's meeting, I decided to make blocks for the charity quilt to show the girl's what we would be making. It took longer for me to choose my fabrics than to actually sew th blocks - it was very easy! Phew! It was a lot of work to put together, but yesterday's meeting was a success. Summer is a really busy time for everyone, so we only had 3 other NEMQG members plus my mom and I in attendance at our paper piecing class at the Sewing Diva. (I begged my mom to come just to increase our numbers, fearing that the shop might want to cancel if we didn't have enough people. At one time I had to tell my mom, "It's not torture" because she really was hesitant given that it was going to cut into her Saturday yard-saling time). My mom grasped it pretty quickly and was one of the first ones done. After making the blocks, we did a quick show and tell. I am in love with Rebecca's zig-zag quilt made out of mostly Modern Meadow fabrics. Modern Meadow is a fabric line I have very little of. To my dismay - I am finding online fabric sellers to have very little of it lately. I put off buying any because Joel Dewberry is so popular - all his older stuff is on sale everywhere, so I figured I would buy some when it was at a lower price.... but maybe this is one of those collections that sells too fast for clearancing! This is a block Jill made for an online block bee that she is participating in. I think it looks great! I didn't finish my block at the class, and afterwards I went with my mom to her home to meet up with Gregory and Nick. Once I got there, I promptly setup a sewing area on her kitchen table and finished up my block. I really like how it turned out and can say I would do paper piecing again. I do have to say that I am really glad the guild purchased fabric for the block kits. Paper piecing is hard and tedious, and I think we really would've had no energy/motivation to keep going if we had hated the fabric we were using. The shop wanted to make a "fall-themed" kit - which is not exactly a keen idea to a modern quilter. The only thing that really stunk was that I was given an incorrect measurement for one of the pieces, so the shop provided the little heart print. When I got to my mom's, I took this really good picture of Nick and Gregory. It was so nice to have an afternoon away and just get lost in sewing with good friends. Our family has been under a bit of stress (anyone know of any entry-level legal positions in the Boston area?) - so it was nice to forget all of that for a little while. Nick took this picture of me with Gregory - I have to say he's getting better at taking pictures! Thanks again to Lisa, Jill, Rebecca, and my mom for taking time out to come to Saturday's meeting. Traffic was terrible and it was a gorgeous day to sacrifice for sewing - but I think it was worth it! I just had to stop working on my long term, boring-ish projects and make something quick today. This evening I am meeting up with some friends, the occasion is to say goodbye to a friend who is moving. She is expecting a baby and won't find out the gender for another week or so, so I had to go gender neutral on this one. Here's a look at my hexagonal flowers - I am going to start sewing them together pretty soon. Tomorrow is August's NEMQG meeting - I am running it because Monet is out of town. We are expecting a small turn-out, due to the craziness of summer schedules. We are meeting at the Sewing Diva in Derry - I met Christine about a month ago and was impressed that her fabrics were affordable and she was actually nice. (Brick and mortar quilt shops probably hate the popularity of online shopping, but can you blame us when so many ladies that run quilt shops are simply grouchy?) She is having a teacher come and help us make a paper-pieced block. I decided on Celtics because I definitely have a lot of green fabric as opposed to navy and red for the Red Sox. Our guild wouldn't even consider the Bruins - given the gross color scheme of black and gold. I will let you know how the meeting goes! Sorry if you are sick of seeing these hexagon flowers - but it's the only thing I have been able to consistently attend to lately (as far as sewing goes). I decided I needed flowers with red and yellow, so here you are. The stack of flowers is looking quite rainbow-ish lately. I am making SLOW progress on the border of the Pop Garden quilt. This is the first time I have tackled applique - unless you count the tie onesies I have made. I can't say I am a big fan of it - it's kind of boring and tedious. 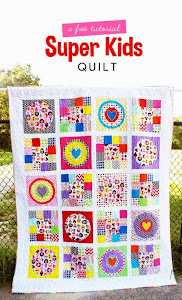 The pattern for the quilt claims you can make this quilt in a weekend, but I don't believe it!